Save money with special discount coupons on vehicle maintenance and repair. We make it easy for you to keep your car, truck, van, SUV, sports car, hybrid, classic car, or high performance vehicle in top condition for years of dependable service. 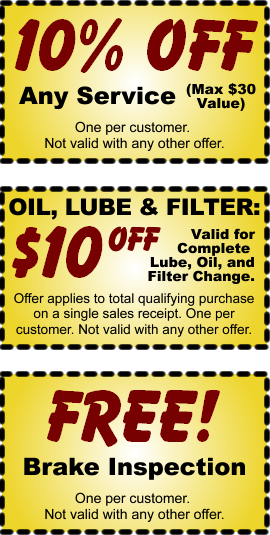 Print out or mention your coupon to the certified master technician at the service desk (at our Seattle neighborhood car repair shop or Bothell car repair shop) when you bring your car in for service or repair. "I have been with them for twenty years, and they have always been absolutely trustworthy, honest, and provided excellent repairs."